Mixed Reaction In Cairo To Obama Speech President Obama's pledge to set U.S. relations with the Muslim world on a new footing was welcomed at Cairo University, the venue for his much-anticipated address to the Muslim world. Reaction to his remarks on various political issues was mixed, however. President Obama's pledge to set U.S. relations with the Muslim world on a new footing was welcomed at Cairo University, the venue for his much-anticipated address to the Muslim world. Reaction to his remarks on various political issues was mixed, however. And we're going to hear some reaction now from those in the audience and beyond. NPR's Deborah Amos, reports from Cairo. DEBORAH AMOS: The president got a standing ovation at Cairo University, as he wrapped up his speech. Someone yelled we love you, and then the only departure from his prepared remarks, the president said thank you. AMOS: Outside the hall, the students took group photos to mark the event. After such high expectations and fears that the president would disappoint, Egyptians welcome Mr. Obama's outrage, says Mahmoud Abaza, the head of the Wafd, Egypt's oldest political party. Mr. MAHMOUD ABAZA (Wafd): I think he was calling for a new start. As a start, I think it's a success. AMOS: The rousing speech in the heart of the Arab world was punctuated with quotations from the Quran. The audience gasped then wildly applauded when Mr. Obama said he was bringing greetings of peace from American Muslims. And he used an Arabic phrase asalaam aleikum, peace be upon you, to address the audience. Nana Maharah(ph), a political science major and a skeptic before the speech, said she was won over by the president's openness to Islam. Ms. NANA MAHARAH (Major, Political Science): It was significant to use peace upon Mohammad, salaam aleikum, a lot of parts from Quran. It means for us that it's a new approach and he specially understands where are we coming from. AMOS: Maharah say she heard in the speech a sense of shared values, including a repudiation of repressive regimes in the region. Ms. MAHARAH: Hip criticism to oppressive regimes really touched my heart because we suffer from it. AMOS: But her views were not shared by some of the dissidents and activists in the audience at the invitation of the White House. Mahmoud Salem, an Egyptian blogger known as Sand Monkey, give the president's speech high marks for opening a dialogue but on the president's political promises, he was more reserved. Mr. MAHMOOD SALEM (Blogger): All in all, in terms of a speech, great speech, great delivery. In terms of substance, especially human rights for example, he's not really going to be hammering on it because it was good diplomatic relations. AMOS: Across the political spectrum today similar reactions to the speech: A sense that the president brought a dramatic change in tone, but judgments are still reserved on the hard issues that separate American foreign policy from Arab and Muslim interests. In one of the many open letters before the president's visit, a columnist reminded Mr. Obama that to win hearts, he had to win minds first. Publisher Hishan Kasam, part of Egypt's opposition movement noted that the president touched on all the issues that are important without giving specific details on how to deal with them. Mr. HISHAN KASAM (Publisher): It's a declaration of good will. But it's not a policy speech. There is very little to hold Obama accountable too in the future on anything he said. AMOS: Deeds not words is an often repeated phrase, says Kasam. This was one speech, an important one, but more must follow to engage the country. Mr. KASAM: The Egyptian state yeah, I mean, you know, tomorrow everybody is going to be back to business. I mean this is not engaging like 95 percent of the Egyptian population. There was just the hype, the excitement. But tomorrow it's business as usual. AMOS: Today, no one in Cairo could miss that President Barack Obama was in town. Cairo's main streets were nearly empty until nightfall, as police fanned out across the city for Obama's address and his visit to a medieval mosque and then the pyramids. A headline in Ad-Dastur, an opposition newspaper, captured the aggravation of ordinary Egyptians. Today Obama visits Egypt, after evacuating it of Egyptians. Deborah Amos, NPR News, Cairo. Iranian supreme leader Ayatollah Ali Khamenei delivers a speech during a ceremony marking the 20th anniversary of the death of Ayatollah Ruhollah Khomeini at his mausoleum just outside Tehran, Iran. 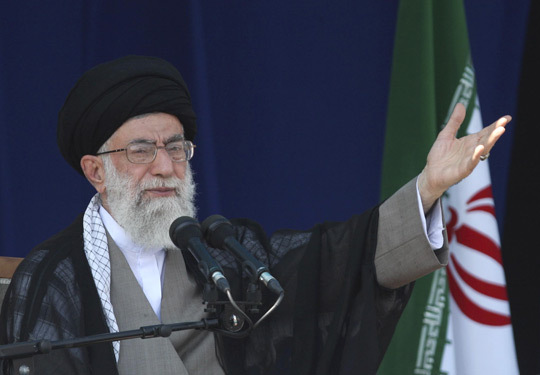 Khamenei says the nations of the Middle East "hate the United States from the bottom of their hearts." Much of the Muslim world and Israel reacted with guarded optimism to President Obama's speech Thursday in Cairo, Egypt, but Iran's supreme leader rebuffed the message of conciliation, saying mere words could not erase deep hatred of the United States. 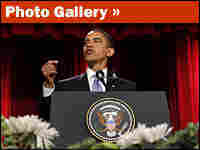 In a speech aimed at setting a new tone for U.S.-Muslim relations after the Sept. 11, 2001, attacks, Obama told an audience at Cairo University that he seeks "a new beginning ... based on mutual interest and mutual respect." Obama said Israel must halt settlements in the West Bank and that Palestinians must have their own independent state. A spokeswoman for Jewish settlers in the West Bank criticized the speech as "out of touch with reality." And a joint statement from several radical Palestinian factions, including Hamas, the Islamic resistance movement that controls the Gaza Strip, dismissed the address as an attempt to "mislead people." Obama promised a withdrawal from Iraq by 2012 and said the U.S. has no desire for bases or a permanent military presence in Afghanistan. Nabil Abu Rdeneh, a spokesman for Palestinian Authority President Mahmoud Abbas, called Obama's speech "a good start and an important step toward a new American policy." He said Obama's reference to the suffering of the Palestinians is a "clear message to Israel that a just peace is built on the foundations of a Palestinian state with Jerusalem as its capital." Israel said it hopes Obama's message can help lead to "the beginning of the end" of conflict between with the Arab world. A government statement Thursday said Israel will "do all it can" to widen regional peace while preserving its own security. In his speech, Obama recalled his childhood spent in Indonesia, where he "heard the call of the azaan (call to prayer) at the break of dawn and the fall of dusk." At several points in the speech, he referred to the Quran, the Muslim holy book, and its teachings of peace. "The use of Quranic sayings plays a big part in a positive change of picture, but there is a necessity for action," said Iraqi government spokesman Ali Al-Dabbagh, who called the speech "historic and important" and "a new start." Obama referred to the difficult past relations between Tehran and Washington and the current dispute over Iran's nuclear ambitions, saying that "any nation — including Iran" should be able to pursue a peaceful nuclear program. 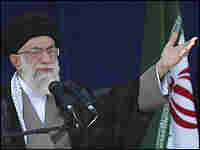 But the reaction from Iran's supreme leader, Ayatollah Ali Khamenei, showed no sign that relations could be eased. He said the nations of the Middle East "hate the United States from the bottom of their hearts." "The new U.S. government seeks to transform this image," Khamenei said at the mausoleum of Ayatollah Ruhollah Khomeini, the radical cleric who led the 1979 Islamic revolution in Iran. "I say firmly that this will not be achieved by talking, speeches and slogans." Obama's address coincided with the release of remarks by Osama bin Laden that appeared aimed at trying to undermine any message of reconciliation. The al-Qaida leader said Muslims' alliances with Christians and Jews would annul their faith and urged them to fight allies of Westerners in Muslim countries. Obama reserved a strong rebuke for Muslims who promote attacks against innocents, saying the Quran condemns such acts and stating clearly that the U.S. will "relentlessly confront violent extremists who pose a grave threat to our security." "We reject the same thing that people of all faiths reject: the killing of innocent men, women and children," he said. "And it is my first duty as president to protect the American people." "Obama's speech is an attempt to mislead people and create more illusions to improve America's aggressive image in the Arab and Islamic world," said a joint statement by eight Damascus, Syria-based radical Palestinian factions, including Hamas. Reaction among ordinary Muslims, from Algeria to Indonesia, was mixed. Baghdad resident Mithwan Hussein called Obama "brave" and hoped for "a new chapter with the Islamic and Arab nations." But a refugee at the Baqaa refugee camp in Jordan was skeptical and wondered if it wasn't just the latest empty rhetoric from an American president. "Bush and Clinton said the same about a Palestinian state, but they've done nothing, so why should we believe this guy?" said Ali Tottah, 82, who is originally from the West Bank town of Nablus. Said Lacet, 56, a civil servant in Algeria, said, "Obama is clearly admitting that Bush's military offensive in Iraq was a mistake." Edi Kusyanto, a teacher from the school in Jakarta, Indonesia, that Obama attended as a child, said he thinks the U.S. president envisions "a world that is pluralistic, where different religions can live peacefully together." But in the end, he said, it was "still a speech about what America wants." In concluding his remark, Obama quoted passages promoting nonviolence from the Quran, the Talmud and the Bible to highlight the similarity of the teachings and the interest of all to live together peacefully. But the reaction of some Israeli settlers in the West Bank showed just how difficult that reconciliation could prove. Aliza Herbst, a spokeswoman for Yesha, the West Bank settlers' council, dismissed Obama's speech as "naive" and "out of touch with reality." "You can have your speechwriters find every good thing a Muslim has ever done," she said. "But more modern history is that the Muslim world is at war with the Western world."